Helen Wang is the translator of Jackal and Wolf by Shen Shixi (Egmont, 2012) and of Bronze and Sunflower by Cao Wenxuan (Candlewick Press, U.S. release on March 14, 2017; Walker Books, U.K., 2015), which won her the 2017 Marsh Award for Children’s Literature in Translation and received starred reviews at Kirkus Reviews and Publisher’s Weekly. Writing in Chinese, Cao Wenxuan also won the 2016 Hans Christian Andersen Award for Writing. A blogger and translator of numerous essays and short stories—as well as a curator at the British Museum—Helen Wang earned her Ph.D. in archaeology and her B.A. in Chinese. Nanette McGuinness: Congratulations on your well-deserved award, Helen! One of the things that struck me in reading Bronze and Sunflower was its lovely, almost sensual use of light and color. What were the challenges involved in finding the right words and ways to convey those shadings in English? Would you say this is typical of Cao Wenxuan’s writing or more typical of children’s literature in Chinese, in general? Helen Wang: Thank you, Nanette! Cao Wenxuan is a professor of Chinese literature at Peking University, and can draw on one of the richest literary traditions in the world. 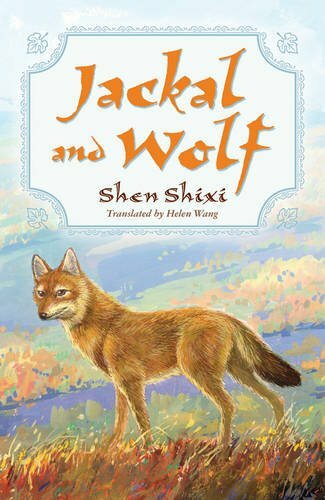 His writing is very different in style from, say, Shen Shixi’s Jackal and Wolf, which is about life in the animal world. In Jackal and Wolf, the story is about a mother jackal who raises an orphaned wolf cub. For English readers, it’s written in quite an unusual style, interspersing facts about the animal world with an anthropomorphic approach. It’s so different from anything else in English, that readers seem to respond strongly to it, either loving it (an American reviewer “devoured” it; a German reviewer called it “ein absoluter Pluspunkt”) or not liking it at all. In Bronze and Sunflower, the land is vast, the reed-lands seem to go on forever, there’s a lot of sky and there’s a lot of water. Cao Wenxuan knows that landscape and he knows how to describe it. When translating Bronze and Sunflower, often I would picture the scene in my mind, then cover the Chinese, and ask myself how would we say this in English—and only when I was happy with the English would I go back and check against the original Chinese, and tweak the English if I’d strayed too far. That might mean imagining the sky full of water, or the mud underfoot, or the sunlight shining throughout the reed leaves. 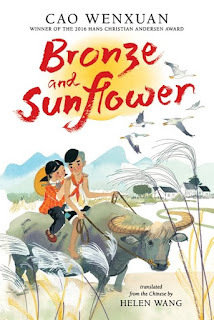 Nanette: Another wonderful aspect of Bronze and Sunflower is the use of repetition in a poetic, almost structural way, as well as the book’s gentle lyricism—the sense of rhythm, cadence, and flow in the writing. How much of these—if any—derive from the nature of the original language itself, in your opinion, or would they more rightly be considered hallmarks of Cao Wenxuan’s style? Was there much of a balancing act involved in rendering that lyricism for an idiomatic, modern children’s book in English? Helen: It has been awhile since I translated Bronze and Sunflower, and looking back at the Chinese recently, I noticed that the most descriptive passages are often the densest in Chinese, typically containing what are called “four character phrases.” These are idioms consisting of four Chinese characters—they can sound good, and look good, and they’re often packed with information referring back to earlier poetry or historical or cultural references. When you see them and read them in Chinese, you immediately know that they’re different from the rest of the narrative, even if you don’t fully understand them. To give a very simple example, in “the sky was vast and the earth was huge” you can see a matching pair (sky and earth), and parallel descriptions (vast and huge). In Chinese, you can say this very compactly in four characters (sky vast, earth huge). I tried to keep these where I could, but at the same time didn’t want the English to sound clichéd. What permeates the entire book is the love within Bronze’s family and their determination to do the best they can for Sunflower. I wanted that to permeate the English in a totally credible way, and the best way to do that was to totally believe in it myself. Nanette: I’m intrigued by some of the mechanics and choices that I imagine went into bringing Bronze and Sunflower to English readers, ranging from the large scale—the historical note at the end—to the middle level (the list of English translations for a chart of Chinese characters Bronze learns)—and the small scale, a description of a fish weighing a jin, followed by the simple statement, “This was almost a pound.” How did you—or you and your editor—decide how to handle situations like these? Was the historical note part of the original book? Helen: In the first chapter, the reader comes across “Cadre School.” Although few English readers will have come across this term, I wanted to keep it for the simple reason that it is the standard translation for ganxiao, and if anyone wanted to look it up, they would be able to find it. Also, Cao Wenxuan describes what it’s like before introducing the term, and then says the villagers had a vague idea what it was, but didn’t really know. So most of the characters in the book don’t know any more than the reader! As for the chart of Chinese characters, I wanted the reader to get as close to Bronze’s experience as possible, and I thought the best way to do that was to keep the Chinese characters. I wasn’t sure if my editor would agree to have Chinese characters in the text, but she did! Most of the glosses in the book (e.g. saying the jin was almost a pound) were in order to keep the original Chinese word—they’re not big glosses, but they’re true to the atmosphere of the story. There are two notes at the end of the book: one is a historical note (which the editor had in mind from the beginning, and which I wrote); the other is about how the story came to Cao Wenxuan (which came from another source). There was also a note in the edition I translated from, the gist of which was “don’t be afraid of hardship: do your best for the right reasons; find joy in the world around you”—all sound advice, but presented in a way that English readers would probably find longwinded and overly earnest. Many Chinese children’s books come with a long note to readers or their parents as to how to read the book, which is quite different from the “show, don’t tell” and “avoid explicit moralizing” approach in English. 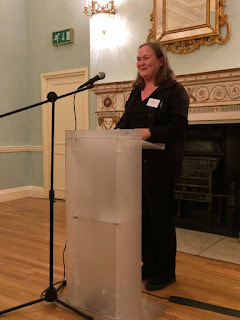 Nanette: Being a curator of East Asian money at the British Museum gives you a wonderfully rich background and expertise in the language and culture—as well as a full schedule! Could you tell us what drew you to Chinese, first of all, and to literary translation on top of that? Also, what parts of your background and training have helped you the most in translating children’s books? Helen: I started learning Chinese at university when I was eighteen. I’d done A-levels in French, German and Spanish, and was vaguely going in the direction of art and archaeology of somewhere beyond Europe, but I decided to learn a language first, and chose Chinese. 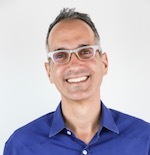 I liked translating, and my first translations were published in the early 1990s, but there was no payment, no feedback and no more translation work came my way. So I went in another direction. I’ve learned a lot working in the Museum, but perhaps the most important experience for translating children’s books was when my children were little and chose Chinese books off the shelf for me to read to them. They don’t speak or read Chinese, so I read in Chinese, and translated on the spot. That also meant editing on the spot. Little children wriggle and fidget if you’re too slow. They complain if the storytelling is wrong, or you miss their favorite words. In other words, I learned that it has to work for the reader. Nanette: You blog at both Read Paper Republic and Chinese Books for Young Readers. Would you tell us more about them? Helen: Paper Republic is a collective of translators. “Read Paper Republic” was this group’s project to publish a Chinese short story in translation, once a week for a year, which we did from June 2015 to June 2016: https://paper-republic.org/pubs/read/. We were a team of four editors, and we called up people we knew and asked if they’d like to join in. And they said yes! We couldn’t have done it without them. So there are now 53 short stories available online free to read. Then, Global Literature in Libraries asked if we would run their blog with a China focus in February 2017. So, again, we called on people and posted a new piece every day for a month, at https://glli-us.org/articles/. And, again, we couldn’t have done it without everyone who joined in. Chinese Books for Young Readers is a web resource compiled by Anna Gustafsson Chen (translator), Minjie Chen (who works at the Cotsen Children’s Library at Princeton), and myself. We met at a workshop in summer 2016 and decided to work together. My experience was that people are interested in children’s literature from China, but there is so little background information that it’s difficult to find out more. So we blog, and introduce authors, illustrators and new books, with the aim of creating an interesting and useful resource in English: https://chinesebooksforyoungreaders.wordpress.com/. Nanette: Thank you very much and congratulations again, Helen! Award-winning opera singer Nanette McGuinness is the translator of over 40 books and graphic novels for children and adults, including the well-known Geronimo Stilton graphic novels published by Papercutz. Her latest translations, California Dreamin’ (First Second Books) and Thea Sisters #7: A Song for the Thea Sisters (Papercutz), will be released in March 2017. I'm excited to see BRONZE AND SUNFLOWER released in the US next week . . . starred reviews from Kirkus, Publishers Weekly, and Booklist! More acclaim to come I'm sure! This is a gorgeous book that belongs in every children's literature library and a beautiful story for all ages to read and savor.